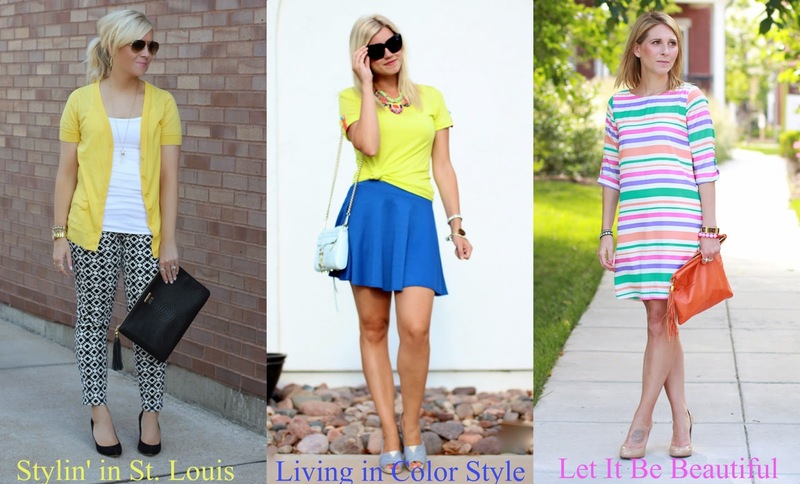 Stylin in St. Louis: Spotlight of the Week: Color Wheel…. Spotlight of the Week: Color Wheel…. Happy Thursday! Today our spotlight of the week is Color Wheel! I love mixing colors and finding different combinations to wear together! This look is black and yellow! I love this color combo…I guess you could say that I stole it from the bee. Come link up for favorite colors! 1. We kindly ask that you follow the two hosts: Elle from Living in Color Style and Jacqueline from Stylin' In St. Louis via Bloglovin or GFC and of course our co-host Ashlyn of Let it Be Beautiful. 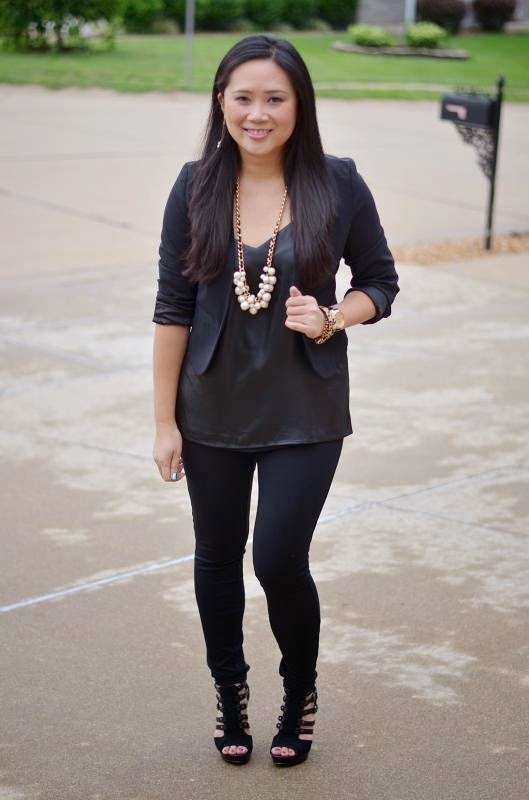 Spotlight: Our spotlight of the week is Carylee of More Pieces of Me. Carylee's all black look is dynamite! This look is layered perfectly. She really knows how to style an all black well. That necklace is the perfect accessory! Be sure to check out her cute blog! Next week: Next week our spotlight weekly this Fall Transition. Thanks for linking up! See you next week! I love your pants! I have a thing for printed pants and these are adorable. I usually don't go with black and yellow together because I feel like a bee, but your outfit doesn't look beeish at all. Very nice! Those pants are seriously amazing and I loved them paired with the bright yellow! So cute! Such a cute combo Andi really like the longer Cardi with these oriented pants. You wear those pants so well! And I'm so jealous of your perky pony! LOVE these b&w patterned pants!! They are so chic, and the fit is fantastic on you. Your yellow cardigan is lovely with this, too - my look is also b&w with touches of yellow :). Thank you for hosting!! Black and white is always so classic and I love when it is paired with small pops of bright color, like you did with the yellow. It looks great! Love those printed trousers! Too cute! Yellow is indeed our color of the week....I am also wearing it! And those pants are phenomenal I swear!!! Black & yellow is such a great fun color combo. Your printed pants are so fun! This is one of my favorites on you! I love the pants and the pop of yellow!! Love the bold print in your pants paired with the soft yellow! So chic! Fun outfit idea!! I love the yellow and black combination. I love love love the yellow! Its a color I never have much of in my closet, but I'm not sure why! It looks great on you! Those pants are too cute!! And I love it with the yellow cardi. Adorable! i love that color yellow on you! and paired with the contrasting printed pants, so cute! also, your hair looks really cute like that! i love the effortless look! I really love that monogrammed tassel clutch! The black/white printed pants look perfect with a yellow cardi! They look like a pair I turned down (and regretted later) from Stitch Fix. I love Stella & Dot jewelry, yet have yet to buy some... I need to fix that! Such a cute outfit! You wear it so well! Love your hair like this!!! & that outfit is so great! I spy one beautiful girly, so cute! I always forget what a fun color combo black + bright yellow is until I see it on someone else-- this is SO cute, and I just adore those pants! Super chic. Do you ever not look incredibly chic?! Love these pants with the yellow! I have been on a huge yellow kick lately which I have mostly paired with black+white so I am a huge fan of your outfit which I pinned. That cardigan is super cute! Have a Great Holiday Weekend, Jac! !